After yesterday’s introduction to the mountains today’s stage is the big one with a long, steep climb leading to a high altitude summit finish. It’s not certain to settle the race but will hand-pick the contenders. 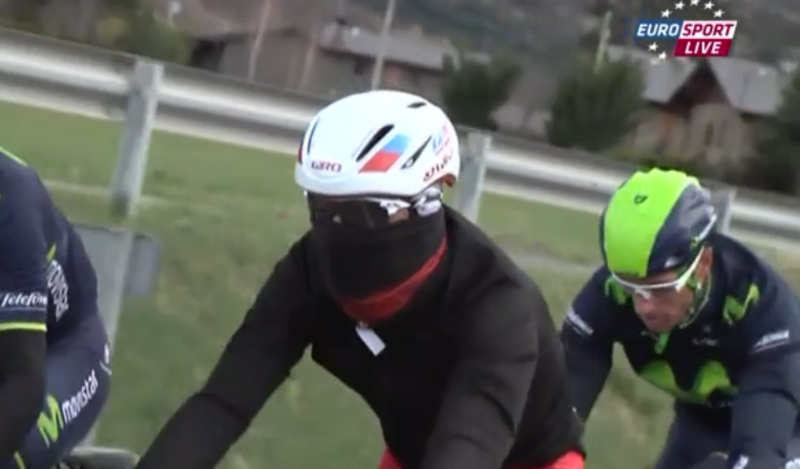 Stage 3 Wrap: the cold had riders worried before the start given the cold descent ahead. An early break went with Europcar’s Kévin Reza the last to be caught with 5km to go. This was where the final climb kicked up but a large bunch, except for a brief effort by Jacob Fuglsang and a shorter one by Pierre Rolland – stayed grouped until the final kilometre when Chris Froome was the first to attack with 800 metres to go, hunched a blurred flurry of limbs. Froome’s move was interesting because it wasn’t cautious, if anything it was reckless with Sky DS Nico Portal later calling it “wild Froome”. If “racing is licking your opponents plate clean before starting on your meal” Froome was a waiter, serving up a wheel to follow for others although only a few could digest his change in pace. A royal quartet formed of Froome, Contador, Quintana and Rodriguez as Froome kicked again but without distancing the others. Then Rodriguez jumped and Contador tried to follow but could not match the effort leaving the Catalan to pull out a substantial advantage and take the race lead. Meanwhile Tejay van Garderen was doing his own thing, no yo-yo for him as he paced himself to fourth place. The first high altitude finish of 2014, this 166km stage features a series of climbs but the first two, Tosses and Canes, average just 3%. But Oix and Rocabruna are significantly harder, averaging around 5% but with peaks of 10% and 14% respectively. Neither are fiendish but help to set up the finish. 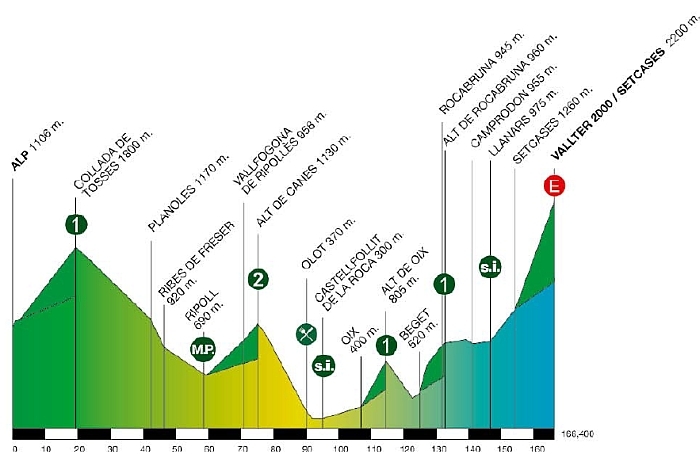 The climb to Vallter-2000 is 12km at 7.8% with sections at 12% and finishes at 2,200m. It was used last year when Nairo Quintana won. The road is wide and consistent but gradient varies on the way with a tough section to the Collet de Xarriera with 4km to go with double-digit gradients. The Scenario: a breakaway should form but we’ll likely see it chased down by teams, especially Katusha. A chase doesn’t equate to a catch especially if some good riders – as opposed to the desperate – go early but today should be all about the big names. The Contenders: Joaquim Rodriguez is the prime pick. He was riding like the Rodriguez of old yesterday with a searing late kick to leave the likes of Contador, Quintana and Froome floundering. His training on Mount Teide in Tenerife means today’s altitude shouldn’t pose a problem. Froome lost out yesterday but that was in part because he was sprinting early, he could find the steadier finish more suitable but he’s yet to train at altitude. Contador couldn’t quite follow yesterday either but a top-3 seems reasonable while Quintana was left saying he’s not quite over a recent virus. There’s no time bonus at the finis today which matters because if Rodriguez arrives with someone else, he might be tempted to gift the stage, obviously or via a contrived “sprint”. Weather: cool and cloudy with a max of 12ºC in the valleys and colder at altitude where a rain shower can’t be excluded. Daily Diaz on Catalan politics: What is Catalonia: a Spanish autonomous region, or a European stateless nation? It depends on who you ask. Last September 11th (national day) there was a massive demonstration calling for independence (or maybe just the right to decide whether or not be independent), and a consultation has been planned next November. Perhaps we’ll know the answer to that question by then. I was brought up by my parents to respect others’ rights with “if you can’t say anything nice about someone – don’t say anything at all” drilled into me from an early age. Thus, to respect my parents, I will not say anything at all about the commentary skills of one Carlton Kirby. However, I did think at the time that he was drawing attention to the attire of Sn. Rodriguez that justice would indeed be served up if said rider went on to win the stage. Perhaps there is some justice in the world after all. The climb to Vallter flats out i the last km, only to kick hard again in the hair pins of the last hundred meters. If Purito hangs on to the parking lot before the hair pins, he’s in for another win. Any other contender will have to outpace him on the long climb from Setcases to have a gap before the final. Watch out for accidents on the decent down to Beget, there are some nasty pot holes, I rode it last week. Catalunya struggles for the right to decide on it’s future of independence, it’s a fair political movement worthy the support of every democracy in the free world. I won’t touch the politics but will note the race has a “best Catalan” prize. Thanks for the pothole info. Sorry again, my guest, for the long and way too personal OT. I’ll try a kind of compensation suggesting to everyone who can ride near today’s stage to discover the Bac valley, turning west from the GIV-5221 between Castelfollit de la Roca and Oix (“la vall del Bac” signal, less than 2kms from Castellfollit). 22 precious kms on a narrow road, quite into the wild, with a couple of steep but rather short climbs. Probably you won’t see a car all the way along. Within 5 kms from the the end of this magnificent detour you’ll find yourself on the stage course again, in Camprodon, just in case you want to climb up to Vallter 2000. A phrase like “Catalunya struggles for the right to decide on [its] future of independence” is assuming that a coherent subject like “Catalunya” can be identified and granted some sort of definition, which is precisely what should be verified. A petitio principii, I’d say, much more than a democratic petition. Typically, observing how Catalunya is tracked back along history, it’s easily noticed that a lot of different political subjects are recognized as *Catalan* (different in the source of their legitimacy, in their national belonging, in culture, in language… with Alfonso the Magnanimous a good while all but unique example of that). It’s a process of creation of identity that many European countries have experienced during the late 18th and 19th centuries, in an age of bitter nationalism which even led to the troubled *unification* of countries like Italy or Germany. Not to say what we got thereafter. Accordingly, the phenomenon has been widely studied, and it’s well-known as a way to build up a sort of continuity (that inevitably makes little historical or social sense, along a span of various centuries), as a justification for the formation of new political powers, usually fuelled by opportunism rather than any consistent ancient legacy. If you look at the main political sponsors of Catalan independence at present, you’ll know what I mean with “opportunism”. To see Barcelona upholstered with posters of an arm raising Artur Mas half Moises half Mussolini was traumatic. Who should decide about the future of “Catalunya”? The pure-blooded Catalans? Catalan-speakers? People living in Catalunya? It’s funny that there has been a lot of debate about the question to be asked, with a pretty curious “two-slightly-different-questions-on-the same-page” result, but very little public debate (on newspapers or such) about “who should we be asking to decide?”. Even less debate has been seen about “what is going to be considered a… decision?”: will you have to get the majority of the electoral basis, or just of the voters? In other words, relative majority, simple majority, qualified majority? Absolute or not? Normally (Wikipedia dixit) “any action that may alter the rights of a minority has a supermajority requirement (such as a two-thirds majority). Changes to constitutions, especially those with entrenched clauses, commonly require supermajority support in a legislature”. Why was “the Question” overfilling newspapers while we can’t read a single line about this? Maybe because the opinion polls say that we’re having a fifty-fifty split, which on one hand contrasts with the official image of massive internal consensus, on the other hand wouldn’t lead any nearer to independence if the consultation was subjected to the usual requirements. That said, I fully support the idea that new cultures, new nations, are created constantly: people have the right to create from scratch a political system they feel at ease with. Until a couple of years ago I was a total backer of Catalan independence. Even if I really hate nationalism, especially when it goes with concept like “ancestral heritage”, “the Land” and so on: but I associated those ideas with Spanish nationalism, and I thought the Catalans weren’t like that, I saw the variety and creativity of regional cultures as an antidote to that kind of centralism. I suppose that the long years of dictatorship left scars: “Beware that, when fighting monsters, you yourself do not become a monster … for when you gaze long into the abyss. The abyss gazes also into you”. Anyway, now I’m just terribly fed up with the amount of sickening propaganda we’ve been put through here. I guess that “the end justifies the means” for many good-faith supporters of independence, but as a humanities researcher I barely stand the quantity of historical/linguistic/political hoaxes you can find on the public Regional-government funded and managed television, or in the local newspapers. That’s a rant, if I’ve seen one. Maybe you know the quote by a famous Catalan comedian: “nationalisms are like farts, the only ones people like are their own”. I really don’t like farts, neither mine. However, de gustibus non est disputandum, I guess. I’d dare to say that not many people would enjoy a room saturated with farts, though. Whoever the author. Surely Matt Stephen’s has a future as a Eurosport commentator. As a rookie he seems to have the essential qualities. He’s not entirely a rookie: he’s worked for the past two or three years on ITV’s coverage of domestic cycling, combining solo pieces to camera with pre- and post-stage analysis. I agree though that he did a good job on the stage I watched earlier in the week, including a couple of moments of self-deprecating humour which always tends to go down well with us Brits. Yes, sorry I had not appreciated his stints on Domestic racing. I was more referring to the “big” racing on Eurosport. I agree, his humour is good and I live in hope that he gets more work as I personally find him far better, both in knowledge and general delivery than “others” I could mention. A well-drawn stage, that can reward offensive teamwork. If Purito is as strong as in 2012 Vuelta, there’s nothing much others can do, except of course making him chase for long kilometers. It still quite open, after today we will have much clearer prospects for the Giro and the TdF. I have no idea why the other GC riders didn’t see Rodriguez attack coming. going full gas in the last 2 k of a climb is what he does best. Froome should have came off the front at 4k then built the lead from there. Like he showed us in TDF 2013, but then again he didn’t have richie porte setting a breakneck pace at the front for him did he. Looking at the compleate GC list and Ryder Hesjedal is well placed. He’s had a terrible 2013 with an embarrassing Giro 2013 and will be wanting to get into form for the up coming Giro, would really like him to achieve a win today, plus he should be well accustomed to the cold weather and it’s probably not going to affect him. why not do a Piece on Ryder the Only Canadian to ever win a Grande tour? The weather has put a real chill to the mountain top action so far. Damn the climate change…damn it to hell! It’s often been cold and the ski resorts are still in action although they normally close this weekend. Don’t wanna sound like a nostalgic… but this never happened when the Volta was in September. It was always sunny and the action used to be superb. On the other hand, the snowy Pyrenees were a feature of the April Vuelta, which was balanced between climbing in the cold and climbing in the sun further South. The September Vuelta is usually (bar last year) balanced between sizzling and scorching. Another excellent showing from Adam Yates. Will OGE now be riding in support of him? Not bad for a neo-pro. A very good ride but today’s stage is something else, the high mountains will probably be too much. Today’s long climb should decide the GC. It will be very interesting to compare the form(s) of the fantastic four as well as to see if someone else can keep the pace or at least reduce the dammage (vanG, Pozzovivo?). Maybe the most interesting stage of the year so far. Funny that Nibali chose completely different races thus avoiding direct comparison. Ad Catalunya. I understand if they want more autonomy and less money transfer towards Madrid. But to split long existing countries looks like an inspiration from/for one eastern agressor against Ukraine. Our old world became very dangerous again. I’m really interested to see what Purito does this year. Historically he has excelled at these punchy finishes, and one-off climbs, but has faltered in the latter stages of a Grand Tour after multiple gruelling days. hasn’t Froome been at altitude for most of the winter training back in Africa? The benefits of altitude training only last about 2 – 4 weeks. Froome has been in the South of France since Oman. Plus Johannesburg is something like 1700m, even climbing in the mountains around there will only start to nudge things. But location doesn’t always equate to altitude given he could have been sleeping in an altitude tent in Monaco or SA. Hi Inner Ring – I think you got your post titles mixed up.